There are a lot of ways to increase property value such as home improvement. However, some projects can be costly. You have to take up the right upgrade that will bring you big return on investment. Speaking of big one, there is a promise in taking up a window replacement project. The condition of your window can be one of the factors in determining the value of your home. Old, worn-out windows are certainly a drawback, not to mention the additional energy expenses they’re costing you. That being said, with the right windows you’re not only investing on aesthetic appeal but also on getting other benefits that will surely attract potential buyers. 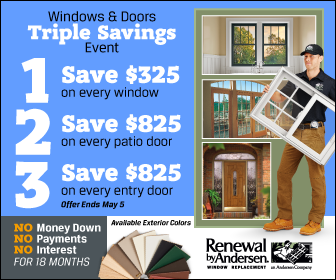 If you want to know more about the value of getting a window replacement, contact a Chesterfield Missouri windows company like Renewal by Andersen®. All of our windows are designed with flair, durability, and energy efficiency in mind. Other window companies are sure boasting of the same, but only windows from Renewal by Andersen® are made up of Fibrex®, an excellent material that allows our windows to have a natural look and appeal. It also prevents the frame from rotting, breaking or cracking. Virtually maintenance-free, our windows guarantee to provide proper insulation for years to come, making your home energy-efficient. Trust Renewal by Andersen of St. Louis for your replacement windows in Chesterfield MO. The value of your property is sure to increase once real estate agents and potential buyers see that your home is fitted with these top quality windows.